A contemporary twist to the traditional picnic table, easy access for easier use. We aim to have your picnic table ready for you as quickly as possible, however it can take up to 3 weeks. If you need the item in a hurry, please enquire about timings before purchasing. 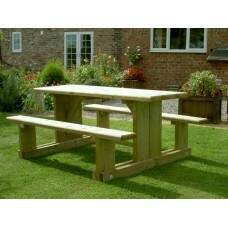 Easy Access Picnic Table (2ft 9ins) PRICE DOES NOT INCLUDE DELIVERY. Local delivery available. I..
Easy Access Picnic Table (4ft)PRICE DOES NOT INCLUDE DELIVERY. Local delivery available. If you liv..